I have been very busy lately, recording courses and writing blog posts. After a while thinking about the content to write about leaves me banging my head on the desk (metaphorically speaking). So I started to think about Infographics. I realised that I like to see them and tend to click on them to see the content which got me thinking. 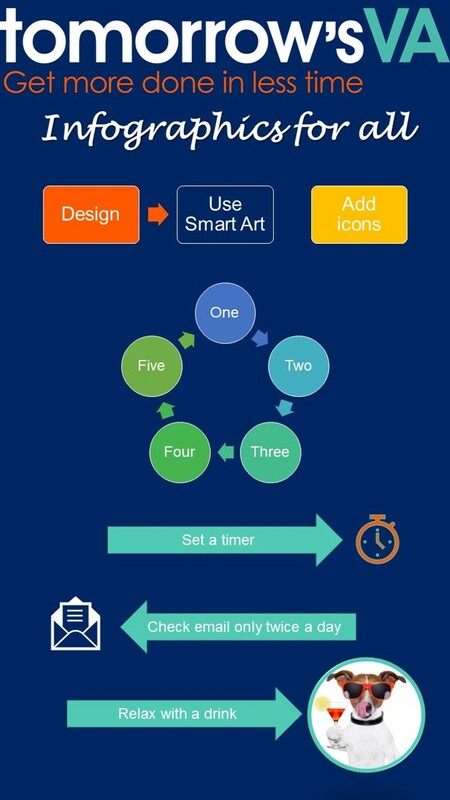 Why am I not using Infographics more frequently? So, I set about answering the question. What I realised was that in order to create an Infographic I need to use specialist software or online software like Canva or PiktoChart. That means going away from my beloved Microsoft Office programs, logging in online and then finding a template that I like and using it. What about customising the template? Well each time I do that from scratch. I bet you can work out where this is going. Yep. I don’t enjoy doing all that extra stuff. I just want to open up a familiar program and create. Better still it will have my brand elements set up. So, I set about working out which of the Microsoft Office programs would lend itself to creating an Infographic. Word will do it, but the page settings mean that as soon as you get near the bottom of the page, you are forced to a new page. 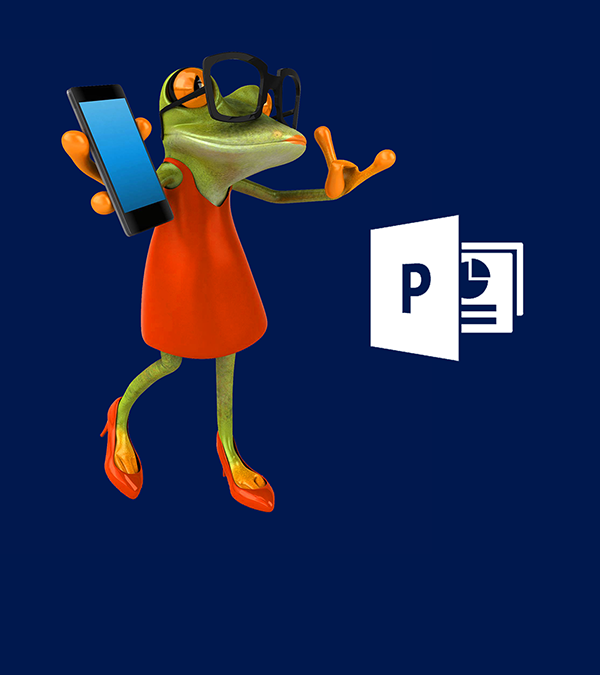 I have figured out how to use all the elements that I already know in PowerPoint (well I do teach it!) combined to create a simple Infographic. To be honest I am not a really creative person, but I found to my delight that I can do this fairly easily using the tools I love. Here are a couple of examples of the things I did. The content is simple – I was focusing on the tools and look rather than the actual words. As you can see, when you create an infographic you don’t actually need many words at all!The best part is once I have this set up, I can reuse it at any time and because I know what I am doing in PowerPoint, changing the colours or shapes is easy. Show me how Shelley – please! Yes, I am going to do just that. 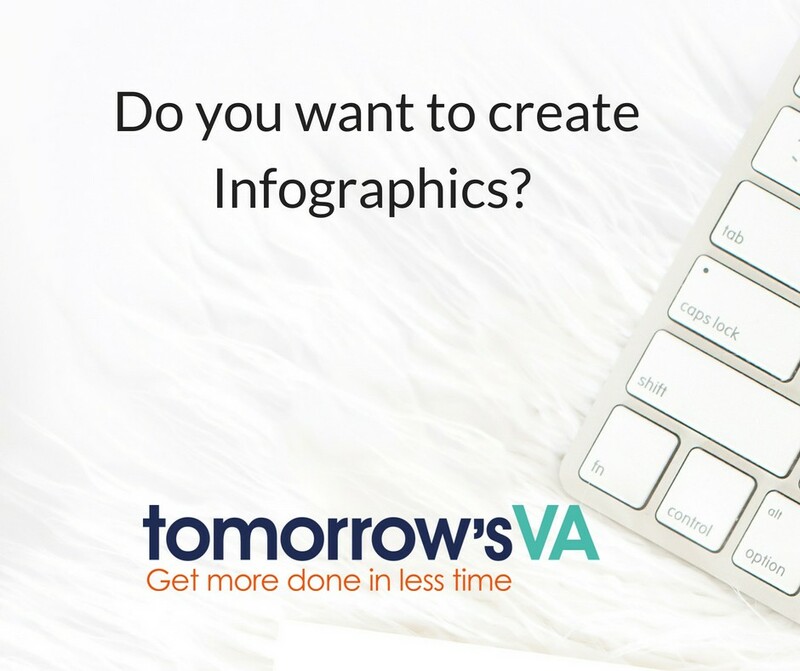 I will be creating a mini course showing you how to create Infographics that you can use again and again and change however you want whenever you want. Without having to buy or subscribe to yet another software package. Let me know in the comment section below if you would be interested in this course once it goes live. The advantages of a cloud-based system over a physical hardware-based one are clear in terms of reduced infrastructure and maintenance costs. But you also want a system which delivers for the people who are using it most – you, your colleagues and clients. Office 365 offers powerful tools for business. Some of the productivity savings it brings will be delivered just by using a number of the basic elements. As you and your clients and colleagues use more of the advanced features and tools, so you will see the benefits and value increase in real terms. Better efficiency. Greater collaboration. Improved productivity. Time saved. More focus on high-value work. Improved performance. All indicators of action towards a healthier bottom line. What’s more, if you ensure that you have the IT training you need to make the most of the technology at your fingertips the savings can really add up very nicely. Just a couple of quick examples of that, to illustrate what I mean. 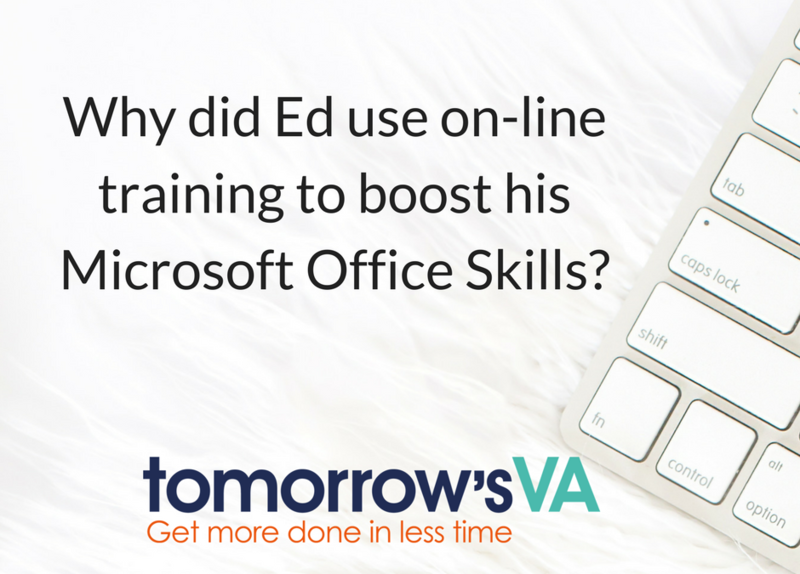 A 90-minute one-to-one IT training session with one VA allowed her to find a faster way to complete a repetitive task for multiple documents. Based on hourly pay and hours saved, this training delivered a time saving worth £2,688 per year. Not just for one year. But this year and every year. 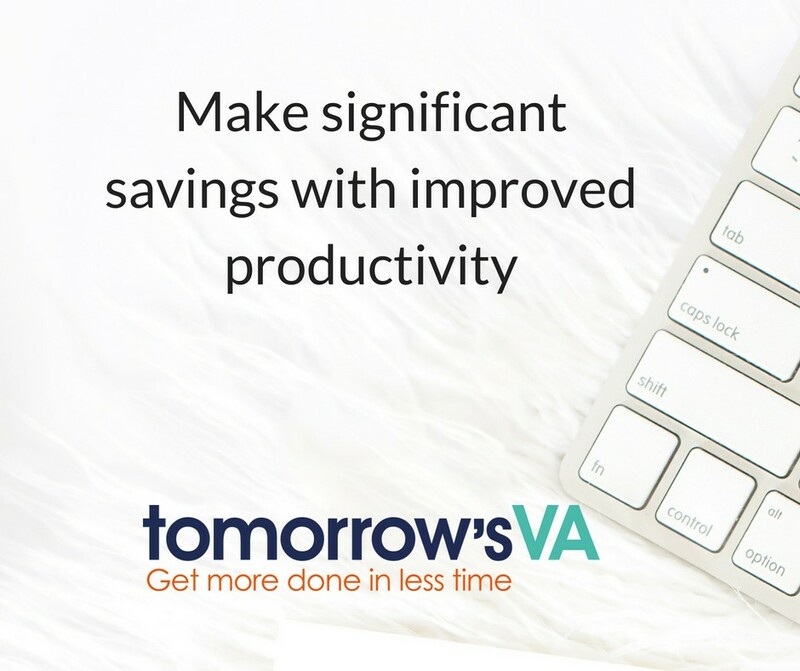 Because once a VA has grasped how to work more productively they can keep using that method time and time again. The productivity saving in this case was worth £1,080 a year. Again, just 90 minutes of training. Taking both cases together. Investment in three hours of 1-2-1 training delivers getting on for £4,000 a year. 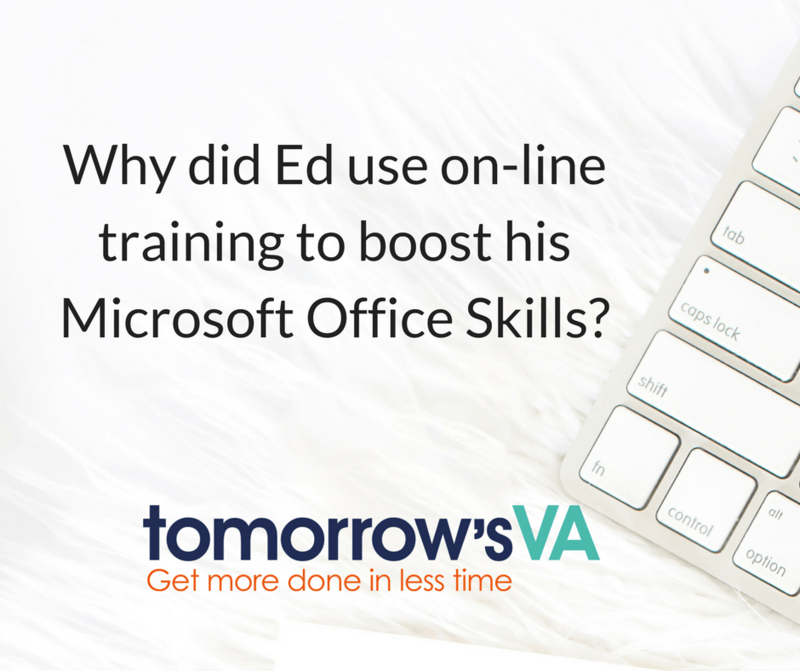 Imagine what the saving could be if you learn how to use all of your Microsoft Office tools effectively? Productivity and making it easier for people to work together are what the solution is all about. Whichever way you look at the result; it’s going to improve your bottom line and enable you to get more done in less time. Make sure you stand out from the crowd by learning how to make best use of your Microsoft Office software. 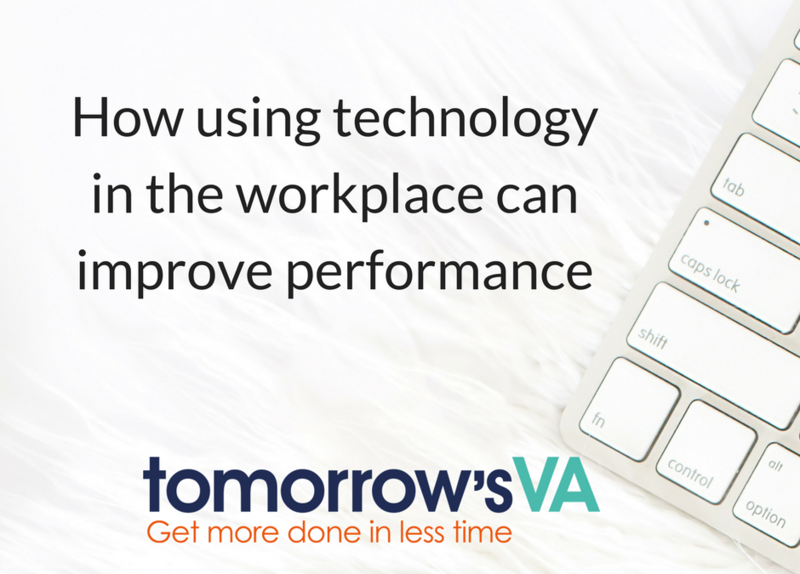 At tomorrow’s VA we are all about empowering VAs to take control of their time, working more efficiently. 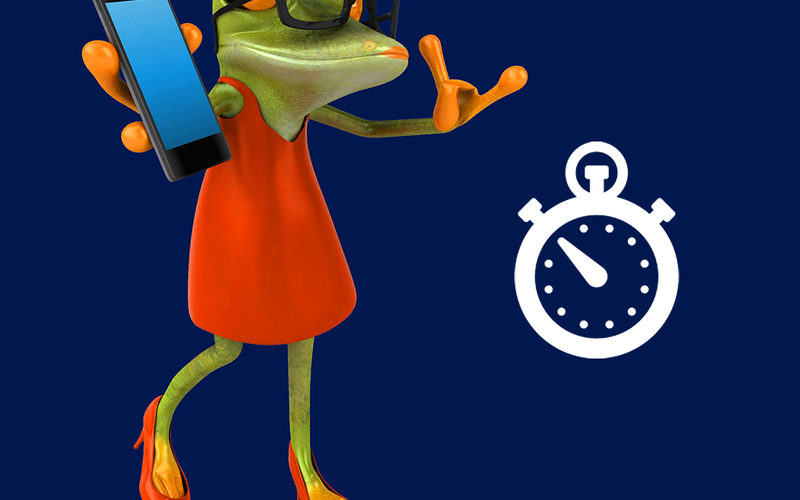 Hop over to our course pages and see what you can get better at straight away! 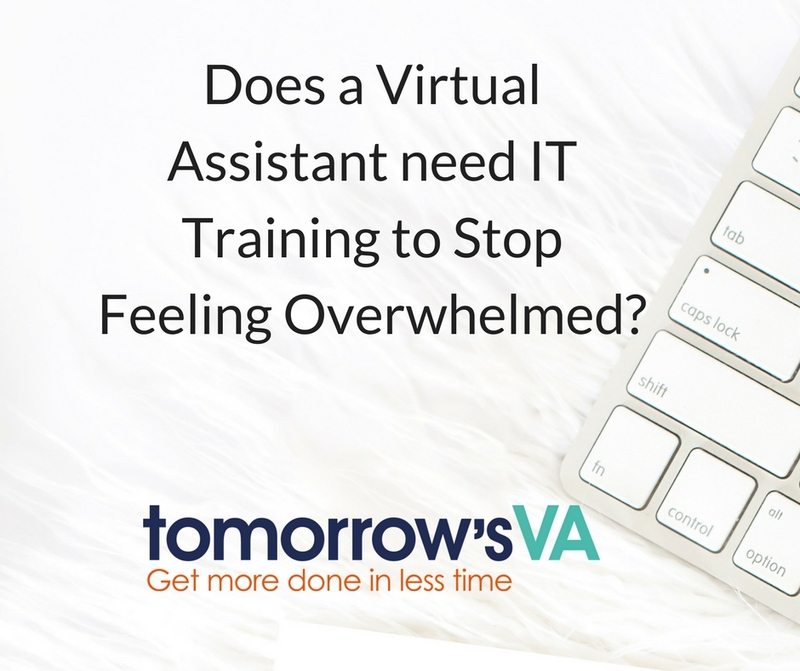 Does a Virtual Assistant need IT Training to Stop Feeling Overwhelmed? Everybody knows that behind every successful manager or company director, you’ll find an organised, efficient Virtual Assistant. Business owners actively lean on their VA, confident that work will be taken care of, in their absence. Virtual Assistants’ tasks and skills can often be divided into technical expertise and personal skills. If “the great skills gap” was already such an important issue of 2015, you can guess what the 2018 situation is. For a VA this can be a really stressful problem. At least not within a VA’s time and business budget, particularly if they have just started the business themselves. Obviously, the Virtual Assistant’s IT training is a necessity, you perform a broad range of tasks that help the individual you work for be more productive. It’s not the purpose of this article to highlight all the duties and skills a VA needs to perform and have. But it is our aim to highlight your need to receive a proper IT Training and support. Why do you need IT Training? As a virtual assistant, you must be extremely organised, must be able to multitask, know your boss’s day / week like the back of your hand, and stay calm should any problems crop up. The right IT Training is essential for maintaining the successful Virtual Assistant’s continuous professional development. 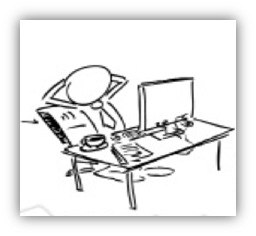 IT Training also helps eliminate the feeling overwhelm. Best possible VA for the person/business you work with. Increase your professional skills and abilities so that you can move up the career ladder. Have the confidence to get the rate you’re worth. If you feel overwhelmed, wondering when and if this will be possible, let me reassure you that you’ll quickly nail the highly-valued IT skills, sooner than you think. 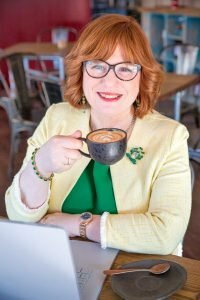 If you have any questions, or would like to find out more about how I can help you learn more about how to use IT to upscale your VA business, please feel free to contact me. Ed decided to take the plunge and set up his own business as a Business Management Consultant. He knew that he would have to be prepared to don a number of different hats in his working day from now on, at a moment’s notice. He intended to collaborate with like-minded business entrepreneurs, build a strong team and support it all with a range of empowering digital tools and resources. His corporate background had given him unprecedented experience and insight in his field and he knew that going alone would require him to work smarter, not harder, to achieve his vision of growing a global business. He called me in to help him see exactly where he needed to concentrate his IT skills, to get the most out of his time and to set up business templates, styles and so forth so he could hit the ground running. In 2 hours we had covered the basics he needed – or so I thought. For Ed, the small ‘stuff’ of business ownership, was a hat he did not really want to wear, but initially he would have to get on with it. He was intent that IT issues would not own him. For Ed, this was his pain! How could Ed as an entrepreneur work smarter not harder and resolve any learning needs as they arose, quickly, easily and cost effectively? As with every entrepreneur, his time is his money and even more so when there is no one to delegate smaller and routine tasks to. He is already thinking ahead about how the smaller things in business can often take the longest. Clearly a day out of the office on a conventional IT training workshop is out of the question for him and with his busy schedule even a 90 minute one to one training session would require planning, time and money. He wants to work smarter not harder. He wants answers at his fingertips! So I have designed a unique online, ondemand, subscription based IT training resource – keeping time loss on the small IT issues to a minimum and looking after the cash flow and the bottom line. So, if an online resource helps Ed, just think what it could do for others too and YOUR bigger business picture! Take a look at courses.tomorrowsva.com – this is where I am building an online learning library of short focussed courses which get you up to speed fast. You can get a year’s access to any course on a one-off basis and membership options will be added further down the line as I add more content. Let me know what kind of issues you have and what you need help with and I will add that to my list of courses to create. This is YOUR learning resource, so I want to make sure it includes what you need. 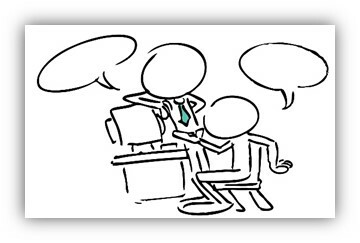 It’s a well-known fact that office workers tend to procrastinate in the working environment. With so many distractions, it’s easy to allow your mind to wander in the workplace, ensuring even the most basic of administrative tasks take far longer than necessary. Whether you work alone at home, in a private office space, or in a large, open plan working area, there will always be something there to take your mind off the job. 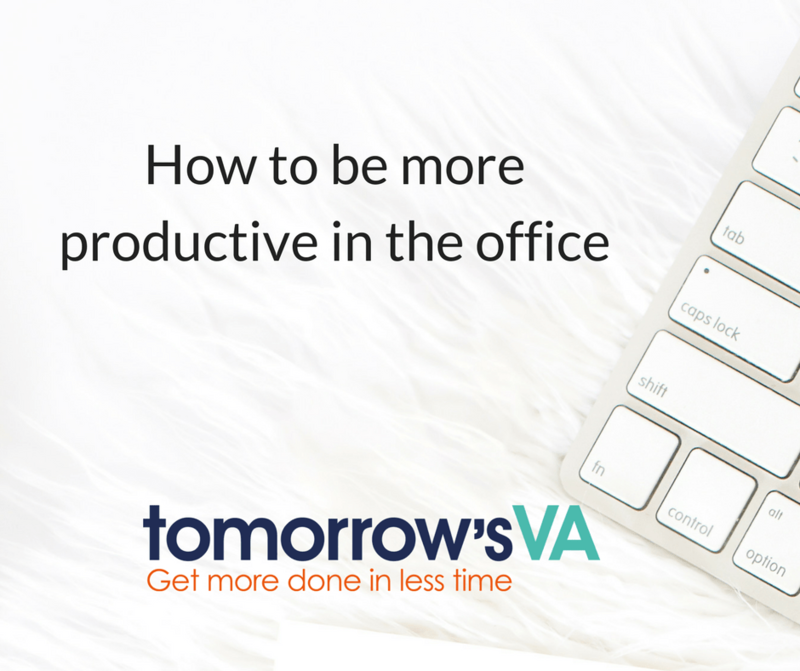 Let’s look at some of the top tips for increasing productivity in the office, to help you work more quickly and efficiently. Sometimes it can be hard to maintain concentration during a long day at work. From time to time, we all allow our minds to wander, particularly if we are doing a mundane task. However, if you want to improve your efficiency in the workplace, you need to combat procrastination and make sure that your mind is completely focused on the job. The internet is one of the biggest causes of inefficiency in the modern office – if you work from home then it’s easy to be distracted by social networking sites, or by checking your personal email. 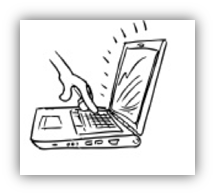 Those working for larger companies may find that internet shopping sites and social networking sites are banned; however, even basic email or news sites can be a distraction from your work, so if you don’t need to use the internet, why not disable your broadband during working hours to increase productivity? You could take your browser icon off the taskbar to stop you being tempted. Make sure that notifications are switched off. Facebook, Email, Twitter, Instagram on your desktop and on your phone. Put your phone on silent or even stick it in a drawer so that it does not distract you. Background noise and chatter can also be distracting. If you work in an open plan office, gossiping colleagues can be distracting, so avail yourself of a pair of earplugs or tune into some work-friendly classical music to help avoid being caught up in office chatter when you have a lot to do. It’s best to avoid having the radio on or listening to music with catchy lyrics as these are likely to distract you from typing, spread sheet work or other office activities. When working in a home office environment classical music in the background can help although some people find that silence really is golden when it comes to being productive. Having strict deadlines tends to make us work quickly and in a more concentrated manner; so, to combat daydreaming and help keep your mind on the job, imagine that your deadline is much sooner than it really is. If your job needs to be finished by the end of the day, tell yourself you have an hour or two hours to get it done: even if you don’t make your own, self-imposed deadline, you will work in a more efficient manner and you should be able to finish the task ahead of the real cut-off point. If you are working on a larger, long term project, break the task down into smaller sections and set yourself a deadline to complete each part; this will help to make the task feel more manageable. If you’re still struggling to get the job done after you’ve broken the task down, try offering yourself small rewards such as five minutes of fresh air or a cup of tea when you’ve completed another section – these might not be huge incentives, but they should allow you to make the most of these small achievements. It is well known that batching up similar tasks is a way of getting lots done. Batch report writing, blog posting – create several and schedule, or email marketing tasks are all good candidates for batching. Like the deadline option mentioned above. Set a timer for say 20 minutes and get your head down to work. You will be amazed what you can achieve in a small space of time. By avoiding common sources of distraction and making a concerted effort to focus in short bursts, you should be able to improve your productivity in the office, making for a more efficient working environment. 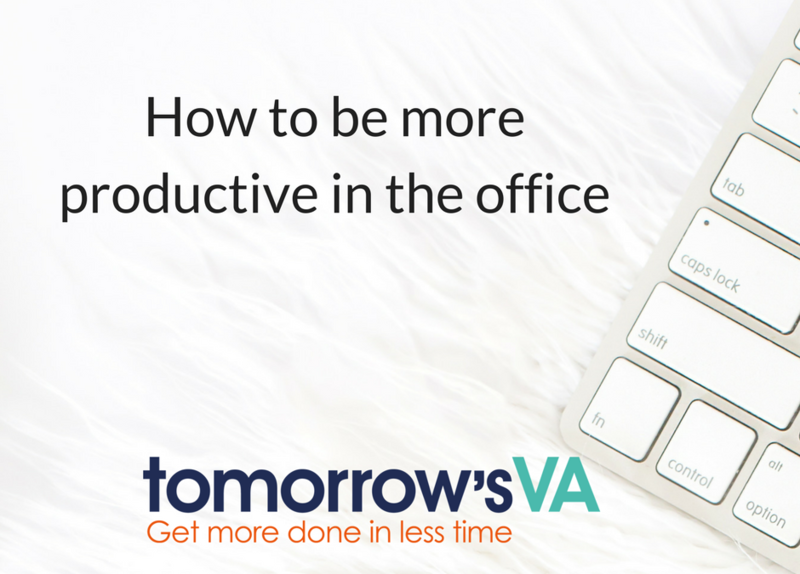 What are your favourite tips for being productive in the office? 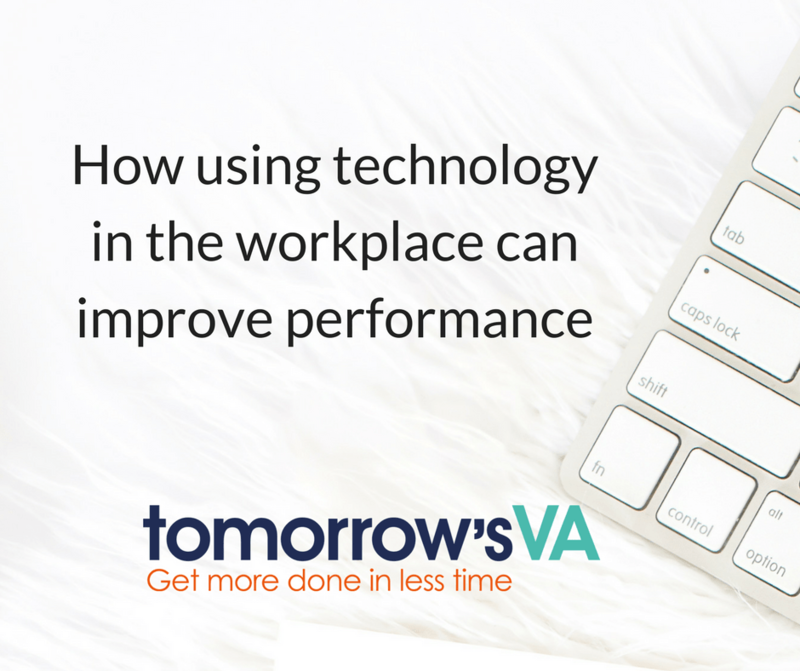 Does using technology in the workplace improve performance in speed terms – do you get more done better in less time? Is the output more accurate? Easier to check? How has this software explosion helped your clients? The answer was a resounding YES on all counts. Here is a summary of what he said. In the olden days accounting was done in big red ledger books. In fact, I remember them – I used to work for a building society and getting the books to balance at the end of the day was for me a nightmare. All the entries would be made by hand in a big red ledger. There would be a column for each type of data and in the end, you might even run out of columns or have to use another page. Not so in Excel you can keep adding columns and rows without the fear of the book getting full up or running out of space. If you made a mistake in the ledger you had to tipex it out and overwrite it, could be a messy process – in Excel simply overtype the mistake and it looks like new. Then you had to add it all up! Imagine sitting there with a calculator or an adding machine adding up lots and lots of entries, if you made a mistake you had to start all over again from the top! Excel does an AutoSum quicker than you can say Add This Lot UP! So yes, getting the information ready to work with is much quicker and more accurate. Apart from User Error that is, but then you can add the wrong information to a ledger book just as well as a spreadsheet and it would be much harder to find. So yes, the output is more accurate and easier to check. How has it helped Clients? By having spreadsheets that can be printed, emailed, turned into pdf files and sent to the client, presenting the information that clients need is much simpler. Clients can follow a spreadsheet without having to look at a daunting big red ledger. It takes up less space too! Just a few areas where technology is improving performance in business. How is technology helping you improve performance and the service you provide to your clients or customers?